In this blog I address the “annuity or lump sum?” and the “if, when and how much to annuitize?” questions with a discussion of the pros, cons and other qualitative considerations that go into this very personal decision. The annuity decision will be built on very many factors, a large number of these, both qualitative and quantitative, are discussed. While I clearly don’t know what the future will hold, some of the basic facts upon which we have to make decisions in decumulation are the same as those in accumulation: market delivers the same returns to all participants, managing spending within/below guidelines consistent with your assets is required, make a financial plan and review at least every 2-3 years, cost is often a primary differentiator between outcomes (whatever approach one chooses), insurance costs money so it makes sense to buy insurance primarily when we are facing a low probability event with very severe consequences (in this case living much longer than the life expectancy (median age of death) for your age group, if we can consider that ‘adverse’); annuities are insurance (which happens to get cheaper as we age) so you might wish to buy them if and when you really need them and only as much as you need. But most of all, it is important to stay flexible/adaptable rather than assume that you can select a strategy or product, and then set-and-forget it for the next 30 years. The final answer to the “Annuity vs. Lump-sum?” question will have to be customized to individual circumstances and attitudes. Typically those whose situation is not black or white, will want to explore the option with some unbiased professional help and hire a fee-only financial planner who is prepared to act in a fiduciary role to help with the decision. While we still don’t have a view what if anything will be recovered from the bankruptcy proceedings, for Canadian pensioners to make up for the 41% funding shortfall, or when pension plan windup will actually occur, what we do know is that when windup does occur each pensioner will have to make a decision: annuity or cash-value into a LIF (Life Income Fund). In fact I did a couple of blogs directly related to this subject back in September 2011 entitled “LIF- What is it and why important for Nortel pensioners”and an earlier in March 2007 entitled “Pension or lump sum?” and a 2009 blog that also looked at some alternatives when there threat of compulsory annuitization was the only apparently available option in Doomed Nortel Pensioners? Outside-the-box Pension Options and Path to Pension Reform . (All pensioners may get an option to consider a G-LIF or Group LIF which the NRPC has been exploring and may become available at some point in time; also, if I recall correctly, Quebec based pensioners may get additional option to defer the annuitization decision for five years and leave the funds to be managed by Regie over that period. I will focus here exclusively on the general “annuity vs. lump sum decision”. will still be alive at age 95. Some planners handle this by defining a ‘planning age’ which might be at the 75- or 90- percentile (rather than 50 percentile) life expectancy point for a single male/female/joint age of death for a couple. Annuities effectively bypass the uncertainty of age of death, by looking at a pool of annuitants of a given age so the insurance company can plan for a much less uncertain life expectancy of the group rather than the individual having to plan for highly uncertain age of death. Those annuitants who die before life expectancy effectively pay for those who die after. -Market risk: not having to deal with the risk and consequences of a very bad sequence of returns (losses) which together with withdrawals necessary to meet spending needs can devastate a portfolio’s value to an extent that it might not be able to recover to meet one’s retirement needs. The insurance company calculates the annuity income on life expectancy and very conservative fixed income investments (e.g. government and/or investment grade corporate bond) and the annuitant no longer has to worry about market risk (but neither will he get the benefit of market returns of less conservative assets). -Mortality credits: annuity income is made up three sources: return on investment, return of investment (i.e. your own capital) and “mortality credits”. The latter are a source of extra return not available by other means (mortality credits are explained here) because the source of “mortality credits” or “mortality yield” is the annuity premium paid by annuitants who die before you. -Annuities bundle investment management and longevity insurance: theoretically annuities eliminate (or more likely just mitigates- see inflation risk above) longevity risk as it allows you to more simply plan, for your life expectancy rather the unknown actual date of death; unfortunately buying an annuity you are not just buying the longevity insurance you may want, you are typically also locking in long-term government/corporate bond rates even if you were not planning to invest in them, as well as ongoing (unknown) insurance company costs/fees. In the US you can buy unbundled “longevity insurance” which is not available in Canada; this type of insurance for a 65 year old typically costs almost an order of magnitude less than an immediate annuity for a similar income stream, but lifetime income only starts at age 85 if you are still alive at that age. -Costs: annuity costs are rather obscure and it’s unlikely to be made explicit (they would include insurance company administrative/management costs and safety factors used by insurance companies on life expectancy and profit margin for a shareholder owned insurance company), LIF costs should be very transparent with major components being administration and investment management fees, and would be very low if you go to an online broker. Some analyses suggest that according to Money’s Worth Ratio, a measure that insurance companies like to use, MWR is about 0.95-1.0 where the MWR is defined as the Expected Discounted Present Value (EDPV) of annuity cash flows when discounted at the risk free rate divided by the initial premium (for an MWR definition see Annuity Markets Around the World: Money’s Worth and Risk Intermediation). But most retirees would tend to invest at least somewhat more aggressively than government bonds so the appropriate discount rate should likely be higher and thus the corresponding MWR lower. The high MWR might fool some to think that this is not a bad investment, however James Hymas in Canadian MoneySaver’s March/April 2011 issue in “Annuity decision” estimates using 2005 US Social Security longevity data that (in his example) the insurance company has to only “earn 0.8% of interest on the invested capital to meet its obligations”. He then concludes that “annuities are a poor investments but annuities are excellent insurance” (of course the Social Security longevity data does not factor in any difference between total population and annuitant population life expectancy, if any.) Annuities being possibly some of the most opaque financial products might increase one’s concerns about allocating more than absolutely necessary to such insurance. As Hymas indicated, annuities are not investments but insurance. Insurance is not free and insurance companies are now mostly for-profit public companies rather than the historical non-profit mutual insurance companies. -Risk tolerance: risk tolerance is a combination of willingness and ability to take risk, i.e. temporary fluctuation of assets or permanent loss of part or all of risky portion of assets; one measure of willingness to take risk would be to look at the type of investments one has been using in the past (e.g. somebody mostly invested in GIC and bonds might be deemed to have very low willingness to accept risk) and how one reacted during the 2008-2009 market crash (e.g. similar if they dumped stocks after they crashed). If risk tolerance is so low that you would likely invest your lump sum into fixed income securities only, then you might be a candidate for an annuity. But there is no such animal as “risk-free”. Annuitization (fixed immediate annuity) would deal with market and longevity risk, but would aggravate the exposure to corrosive effects of inflation risk. -Handling of PBGF guarantee for Ontario pensioners: the mechanism is unclear of how Ontario based Nortel pensioners’ PBGF guarantee would make whole the first $12,000 of pension if lump-sum is chosen (as opposed to a default annuity); i.e. will there be a lump-sum to cover the shortfall or the payment will be made as an annuity? -Capability/willingness to potentially manage a large portfolio, dynamically manage withdrawal rates and annual spending: if you are unwilling/unable to manage your portfolio of assets that might push you further toward annuitization and/or to working with a financial planner for a fee, as that would basically free you from any investment management activity other than trying to manage your spending within your available income sources. For those who might chose a 3rd party to (plan and) manage assets you must factor into the return assumption the planner/manager cost to come up with realistic comparison. Annuitize or not? If yes, when and how much? -some will argue that you want to cover your Basic (but not Discretionary) income requirements with (preferably inflation indexed) annuities/pensions (like OAS, CPP, other pensions) to make sure that these are covered for you (and/or your spouse/partner) are alive. Once basic expenses are covered they may suggest the balance of the funds be allocated to fixed income and equities with equities ranging from 20-60% of the remaining assets or just build annuities into your fixed allocation. -Wade Pfau in a very interesting just released paper “Efficient frontier for retirement income”suggests that the optimal decumulation approach for a 65 year old couple with a spending goal (in excess of Social Security income) equal to 4% of assets at retirement date adjusted annually for inflation (when considering some mix of stocks, bonds, fixed SPIAs, and indexed SPIAs and VA/GMWBs) is a mix of stocks and un-indexed fixed SPIAs. There is an earlier paper by Ameriiks, Chen and Ren “Comparing spending approaches in retirement” in which they compare different decumulation approaches (including annuities) but you must bear in mind the fees here are those that “could be available in the marketplace” for fair comparison of the capabilities of different approaches, but do not necessarily represent what can/is typically be bought in the marketplace (especially in Canada); so results may not be representative of realistically available outcomes. In a 20011 blog entitled Vanguard GLWB vs. other decumulation strategies I compare fixed annuities with Vanguard VA/GMWBs, high cost VA/GMWBs and proportional withdrawa strategies with and without Floor and ceiling constraints. – respected pension expert Zvi Bodie for years has been arguing that the only safe solution is to use inflation indexed annuities for all of one’s retirement needs. Even if one might not actually implement it as such, a good measure of the cost of retirement is the premium for an indexed immediate annuity to cover the estimated annual expenses; for a 65 year old couple (in the US where it is available) the annuity rate would be about 4% or a premium of 25x the required indexed annual income (if you can afford this- few can). -An un-indexed annuity for the 65 year old couple would be about 33% lower, i.e. an annuity rate of about 6% or about 17x the annual un-indexed annuity income. So a retiree 65 year old couple could choose between the perceived relative certainty of an inflation indexed annual income stream of 4% of the premium or take a higher annual un-indexed income of 6% at the same premium (start with a 50% higher income but live with the inflation exposure over the next 30+ years; in both cases one makes an irreversible decision to give up control of a large pool of assets (25x/17x annual income) in exchange for this ‘relative certainty’ guaranteed by the insurance company. Alternately one could start with 4% withdrawal strategy from a balanced portfolio and accept some risk of running out of money after about 30 years, but with some reasonably high probability of having a significant residual estate. -in a number of papers (e.g. “Lifelong retirement income: The zone strategy”) Jim Otar proposes a zone-strategy where he defines asset points below which you must annuitize (e.g. cost of inflation indexed annuity) and above which you can proceed with the safe withdrawal rate (essentially the traditional 4% rule). (Unfortunately, there is little gap, grey zone in his nomenclature, in today’s interest rate environment between his red and green zones. Now let go back to what we are trying to here, i.e. making the annuitization decision.What follows is not intended to override any of the arguments/considerations discussed above in Reasons to annuitize, Reasons NOT to annuitize, and If annuitization is desired or necessary, consider sections above. In the discussion to follow we’ll just add a quantitative dimension to the decision making process. One approach that may provide maximum flexibility is to start by using the proportional 4% rule, but only start considering fixed SPIAs (fixed immediate annuities) when required withdrawal rates to meet Total expenses rise (well) above 4% (say 5%) but must start buying an annuity no later than when assets approach (say within 20% of) the level necessary to cover Basic (or minimum) expenses with the annuity rate (in both case expenses heare refer to those not covered by existing lifetime income sources. Furthermore, only annuitize as much as necessary to allow continuing with the proportional 4% rule for the remaining assets. I haven’t simulated this as yet, but on the surface it might be workable, and might provide maximum flexibility. In the meantime I built a couple of spreadsheets that might help us explore the trade-off between annuitizing or not; both the Generic annuitization decision and (Nortel) more specific Lump-sum vs. annuitization decision. 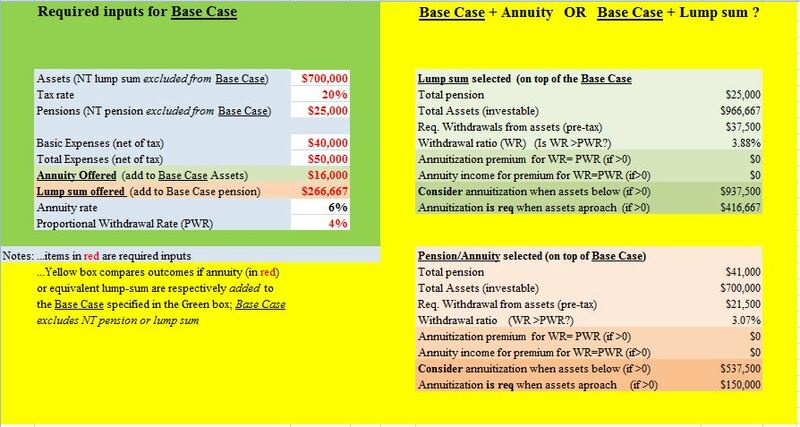 Let’s examine the spreadsheet which considers on Sheet 3 the Generic annuitization decision and on Sheet 2 the (Nortel) Lump-sum vs. annuity decision. In this example, the couple has $700K assets and $25K of pensions; Basic (minimum) and Total expenses (net of tax) of $40K and $50K respectively. Annuity rate is 6% and proportional withdrawal rate (PWR) is 4%. This constitutes the Base Case which is displayed in the top right-hand panel. The required withdrawal amount is $37,500 to cover Total expenses (pre-tax) which corresponds to 5.36% of the available $700,000; to get to the 4% withdrawal level, above which we start considering annuitization of some assets, we’d need $937,500 of assets. So our $700K assets are in-between the $937,500 (driven by Total Expenses(less existing pensions, to be generated at 4%) where we might start considering annuitization but above $416,667 (driven by Basic Expenses (less existing pensions) to be generated at 6% annuitization rate). A withdrawal rate of 5% for a couple of years would not be considered worrisome by many, though beyond 6% would require some action; still others would be driven to at least take some or all of the lump-sum as an annuity for additional peace of mind, especially if the annuity rate is very attractive. Let’s examine the impact of annuitizing $300K of the $700K assets (as is specified in the left panel as an input). The result of this is shown in the bottom half of the right hand panel. Note that Total pension/annuity income increased from $25K to $43K, assets decreased from $700K to $400K and we reduced withdrawal ratio from 5.36% to 4.88%. While with $400K assets we are still below the now $487,500 level where annuitization might start to be considered, we are now well above the new $116,667 level, about 20% above which we’d have to annuitize to protect coverage of Basic expenses. You can explore other situations including your personal circumstances using Sheet 3 of this spreadsheet. Here on Sheet 2 the left panel requires (and here uses) the same input data, except now Annuity offered and Lump-sum offered are both required inputs whereas Annuity rate (now in ‘black’) is calculated rather than provided as an input. The bottom panel on the right-hand side, illustrated the situation if the Annuity is selected instead. Here, after including the new annuity, the required withdrawal rate is shown at 3.07% (<<4.0%) and existing assets of $700K are above $537,500 where annuitization might start to be considered and well above (almost five times higher) the now $150K floor approaching which annuitization would be required based on Basic (minimum) expenses. 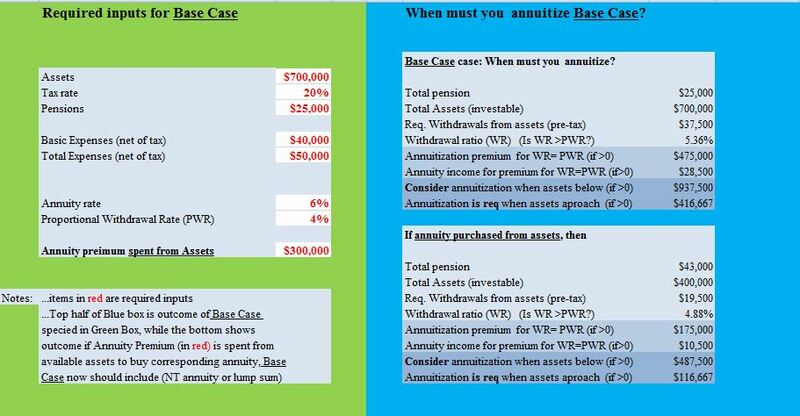 Again one case use Sheet 2 spreadsheet to explore different Lump-sum vs. Annuity scenarios. It is worth noting that depending on one’s aversion of annuitization, reducing or eliminating, temporarily or permanently, discretionary spending would be another mechanism of reducing the required withdrawal ratio to a more comfortable level. On could look at the annuity or lump sum decision very simply and accept the annuity option (“status quo bias”) as these pension assets were/are already effectively annuitized, and whatever financial plan we already have is based on that. So the path of least resistance is to accept the annuity. Alternatively, we might wish to ask whether we would buy an annuity if we already had in our possession the lump-sum offered instead of the annuity. i.e. make an explicit decision to buy the annuity. Therefore this is potentially a non-trivial exercise due to the multitude of considerations that can come into play. The answer to the question will have to be customized to individual circumstances and attitudes. Most of those who want to explore this option will likely need some unbiased professional help for this task. While I clearly don’t know what the future will hold, some of the basic facts upon which we have to make decisions in decumulation are the same as those in accumulation: market delivers the same returns to all participants, cost is a primary differentiator between outcomes, managing your spending within/below guidelines consistent with your assets, make a financial plan and review at least every 2-3 years, insurance costs money so it makes sense to buy insurance primarily when you can’t self-insure (low probability catastrophic outcomes) and annuities are insurance (which happens to get cheaper as we age) so you might wish to buy them when you really need them and only as much as you need, but most of all stay flexible/adaptable rather than assume that you select a strategy or product and set-and-forget looking at it for the next 30 years. Excellent/thorough analysis. Wish your blog was available in 2002, when I had to chose between Nortel pension and LIF. I chose LIF because I was worried about Nortel bankrupcy, wanted to leave a larger legacy, and knew I could always buy an annuity later on (if interest rates improved). Also, since my wife was a federal employee with a good pension and health coverage LIF made more sense. In hindsight, my decision was a good one. The stock market was good to my LIF till at least 2008. Nortel DID go bankrupt. My wife’s federal pension, my CPP/OAS/UK/US Pensions etc. cover my essential expenses and my LRIF covers non essentials. To reduce volatility further, I am now considering moving a %age of my LRIF to an annuity OR give it as a donation (that will give me immediate tax benefit and a fixed — about 4%? — monthly income). Any thoughts on an annuity vs. gift/donation? A clarification on ‘fixed montly income’ for the donation option.. 4% is the ANNUAL return, the payments are MONTHLY. I can’t say whether an annuity (through a charitable institution or not) is the right approach for you personally, since that depends on your personal circumstances. You sound like you are in pretty good shape given your spouse’s pension and benefits. Some obvious considerations would be: you and your wife’s ages, health, what’s your required annual draw rate from your assets to meet discretionary expenses, how would your situation change if your spouse would pass away before you and how that might impact the pension and benefits available to you. Don’t forget to factor in the potential erosion of the buying power of an annuity especially if you are a young retiree in relative good health, the credit rating of the annuity provider, as well as your risk tolerance (willingness and ability to take risk). Hope this helps to get you started, but if you need more customized help, I suggest you find a fee-only financial planner (not an annuity sales person) who will provide you help with the annuity decision on a fiduciary basis for an agreed to fee for a consult. What should an ex-employee that worked for Nortel for about four years from 1992 – 1995 do? I paid into the fund during this time and am getting my (small) state pension from the Canaduan government. Who should I contact about my rights?